As a chiropractor, Dr. LaGana focuses on evaluating, relieving and correcting spinal imbalances (subluxations). These subluxations cause a decrease in normal spinal motion and cause pain by putting imbalanced pressure on the spinal bones (vertebrae) and spinal discs. In order to relieve pain, improve mobility and spinal function, these subluxations must be successfully repositioned (adjusted) back to their normal position. This is the primary goal of successful chiropractic treatment. Dr. LaGana has been thoroughly trained in two specialized chiropractic techniques that emphasize the utmost importance of functional balance and stability of the spine and pelvis and combines these techniques in a specific sequence. Although spinal adjustment (correction) is the central treatment approach, other complimentary and adjunctive procedures are usually incorporated in the treatment program (manual lumbar traction, trigger point therapy, general and rehabilitative exercises, thorough review of proper body mechanics and when to use wet heat and/or ice application). Although our main interest is treatment of low back and sciatic conditions – our treatment techniques are also safely used on all spinal areas – especially the cervical (neck) region and its unique problems. It is important to recognize that many people are experiencing increased structural and nerve problems with their cervical (neck) spine due to the excessive amounts of time spent hunched over computers and now complicated with the face forward and down position while texting. “Rounded shoulder syndrome” with accompanying neck and shoulder pain, stiffness, and sometimes arm and hand pain, weakness, and numbness is common. The neck (cervical spine) is the smallest, most delicate and most moveable of the three main spinal areas. It is subject to the compressive force of holding a 7-10 pound skull all day, it is also adversely affected if the other two spinal areas below it are imbalanced for any reason. 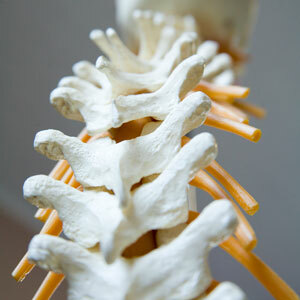 The cervical spine will wear (bone and disc) degeneration quicker than any other spinal area. Advanced Activator Technique combined with the Pronex Cervical Traction Protocol, modification of cervical body mechanics and specific exercises, offer a safe and effective way of treating cervical (neck) problems. We stress the importance of each patient being able to take control of their structural and function health (Active Care). We believe in giving each patient the knowledge and tools to be able to accomplish this with the least amount of time and money and that can be done at home for the least amount of inconvenience. A specialized sequence of “CORE” movements that, in conjunction with the chiropractic corrective spinal adjustments, help maintain and methodically improve spinal health and function – full spine but especially the low back. Equipment Required: Balance Ball 55-75 cms. Depending upon height and 1-2 yoga/exercises mats. Ultrasound is a well known therapy. It is a passive therapy, meaning it is done for you. Dr. LaGana has found that ultrasound is most effective when used as a supplemental aid to the corrective procedures and not as a stand alone option. The goal of ultrasound is to help relieve pain by decreasing muscle spasms and chronic inflammation. Ultrasound increases local blood flow to damaged tissue, accelerating the healing process.